Location: Joué-sur-Erdre, in the Loire-Atlantique departement of France (Pays de la Loire Region). 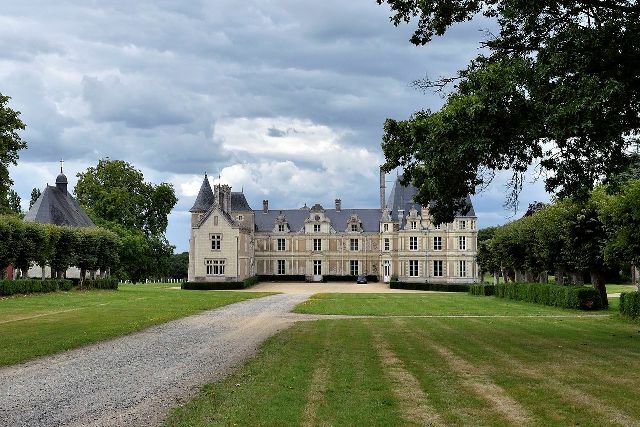 Notes: Château de Lucinière is a castle in the municipality of Joue-sur-Erdre Loire-Atlantique. The construction extends from the seventeenth century to the eighteenth century and nineteenth century. The castle was home to a stud farm, called "stud Lucinière".Originally it was a castle. In 1485, the castle was sold by the family in Montfort-Laval Pierre Landais. The name of the manor was then "Roche-en-Nort". She was under the control of another lordship, that of "La Roche-Bernard." August 13, 1487, after the failed siege of Nantes (June 19 to August 6, 1487) held by the Duke of Brittany, Charles VIII and Anne de Beaujeu camped with their troops around the castle Lucinière in the Played parish. The castle was later acquired by the cardinal Guihe.Cornulier family had recourse to the Duchess of Mercoeur and obtained the annulment of the decision. The castle then underwent three changes from 1681 to 1682. The Renaissance castle, framed in turn, is thus increased by a central main building and a pediment looking to the Erdre. At the same time, André Le Nôtre, gardener of the royal park of Versailles, came to trace the avenues. At the end of the eighteenth century the castle was looted and burned. All that remains of ancient remains that three turrets belonging to the present castle and a small chapel which houses some family graves. The glial Mézaubran of Adolphe, came to Lucinière by marriage in 1884 with Maria Theresa Cornulier (1865-1903). During the Occupation, the Earl and Countess of The glial Mézaubran, owners of Castle Lucinière, protect ten Jews, including several children. They will receive 10 October 1999 the Medal of the Righteous, awarded by Yad Vashem.